NATS has teamed up with the Hebridean Whale and Dolphin Trust (HWDT) to ensure the safe and successful use of drones while undertaking efforts to conserve whales, dolphins and porpoises in Hebridean waters. The Trust may well be the first marine research organisation to use drones in the UK to aid the conservation of cetaceans (marine mammals) and as a supporter of responsible drone use, NATS wanted to help. As a provider of UK drone training courses for commercial drone pilots, NATS offered the charity complimentary places on a course so the drone pilots could be instructed to obtain the knowledge and confidence necessary to operate a drone safely and proficiently. The NATS course outlined the knowledge and operating procedures needed to obtain CAA permission to operate the drone. Additional specific training on how to fly it in the challenging environments experienced at sea was also given. The electronics retailer, Maplin, also contributed a free drone for the charity to use, along with maintenance for the first year. The support from NATS and Maplin has enabled the Isle of Mull based charity to use drones on land or from the boat for their exploratory work. It will enable them to set up their proposed ‘Whale Trail’, which shows the best places on land around the Hebrides to see cetaceans, such as the resident pod of killer whales off the west coast. Their drone will also be used from the boat to fly over pods of whales and dolphins, filming them and creating records of particular species. The HDWT recently launched a new sightings app called ‘Whale Track’ for people to report their sightings of whales, dolphins and porpoises from across the West Coast of Scotland. Anyone can download the app for free from the App Store and GooglePlay. NATS has an app called, ‘Drone Assist’ designed to help pilots fly their drone safely. The app is available for free on iPhone, iPad and Android devices. 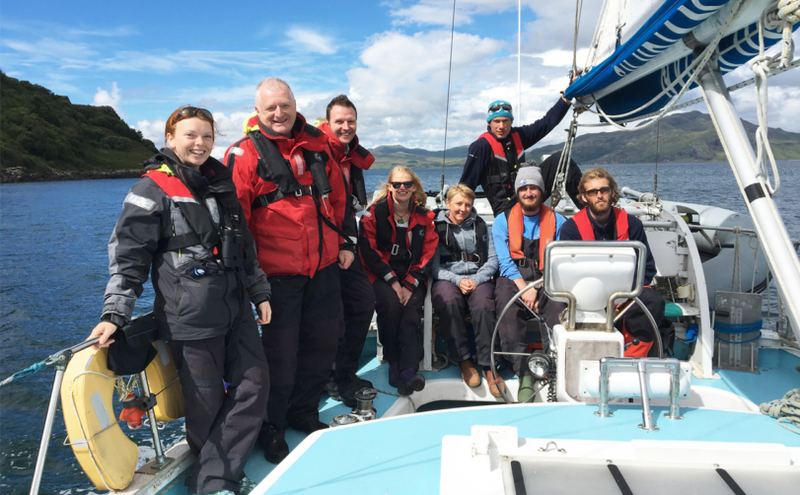 Photo caption: HDWT volunteers and NATS employees on board the charity’s research vessel Silurian.